MAXQDA is the mixed methods expert! 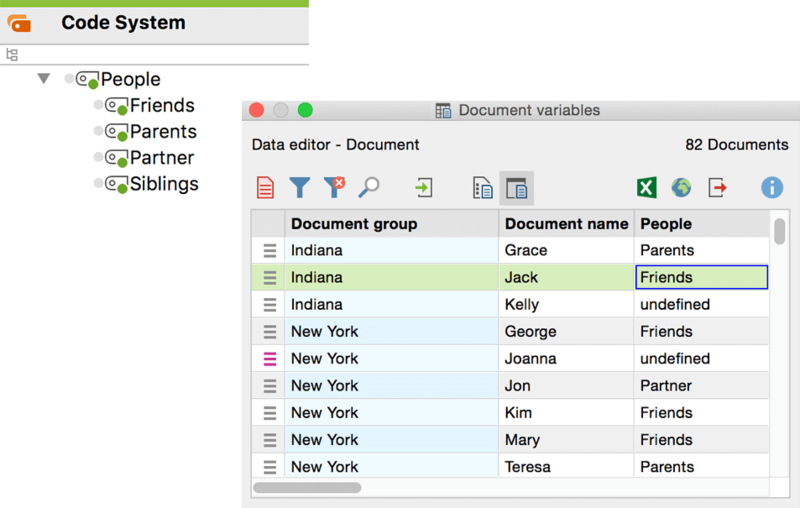 You can import and export quantitative data matrices to and from statistics software packages like SPSS. You can turn your codes into variables, use crosstabs, automatically or manually assign variables to your data, and export any part of your project to a spreadsheet. You can also explore and visualize code frequencies: Generate Configuration Tables to explore how often combinations of codes appear in specified documents, and produce bar graphs and pie charts of variables and codes. Your results may be exported to Excel, HTML, RTF or PNG format. Create Frequency Tables and Diagrams with MAXQDA. With the help of the Statistics and Graphics module, MAXQDA can create frequency tables and charts which indicate the frequency of subcodes. The colors and captions of your charts are editable and the result fits perfectly into your report or presentation. 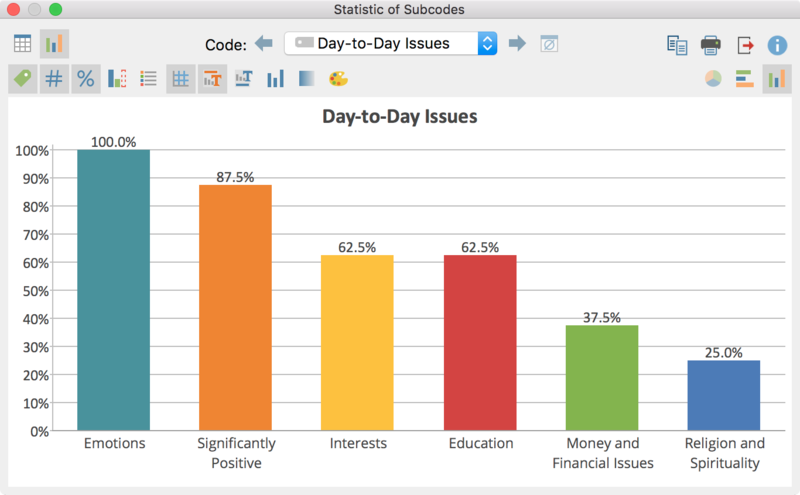 Visualize and quantify relationships between variables and codes. Compare the code frequencies of various groups with each other. Are female students participating more in training groups? Do male students read more text? The options to view the values as row or column percentages make the interpretation of the data even easier. Easily identify and quantify similarity or dissimilarity in code frequency across your data. Multiple similarity measurements available (Jaccard, Kuckartz & Rädiker, and more). The display of coded segments by variable value in the interactive quote matrix is perfect to view already coded data by category. The Quote Matrix is based on the same idea as the Crosstab, i.e. to create a joint display of themes and quantitative variables. It does this on a more detailed, non-aggregated level. Here the coded segments themselves are listed in the cells of the matrix, not only the number of coded segments for that particular cell. Retrieve results based on document variables. Quickly identify those interviews that were recorded with women who live in New York City and look at what their opinion was on a certain topic. Of course you can save this group in a document set for later purposes. 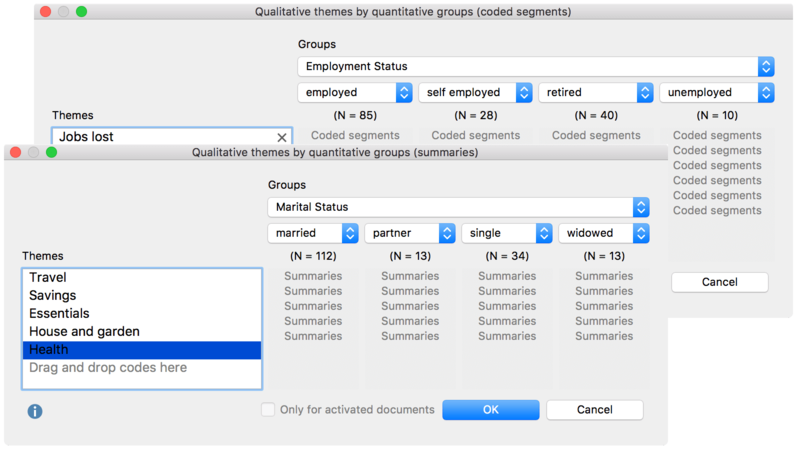 Yet another way to combine quantitative data and your codes or categorical variables. Calculate various variables and their percentages (means, standard deviations, etc.) for qualitative typologies. Researchers who analyze their data with scaled content analysis processes can create categorical variables from the code system: a code – which has subcodes that place text segments on a scale (e.g. a scale of how authoritarian the subject’s teaching style is) – can be transformed into a variable in just a few mouse clicks. Every document in the project will then be assigned the appropriate value based on the subcode assigned most often in that document. 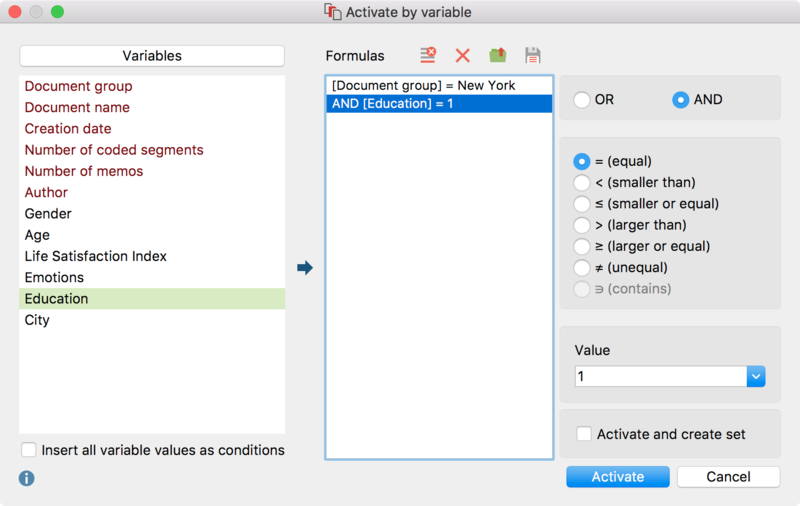 This allows you to use the automatic activation function to only activate those documents in your data set that contain interviews with teachers showing a highly authoritarian teaching style. And the best part is that the categorical variables are dynamic; they automatically update as you keep coding. Joint Displays are visualizations and tables that integrate data and/or results from both a qualitative and a quantitative database commonly used in Mixed Methods research. There are five types of Joint Displays currently implemented, allowing you for example to compare coded segments or summaries for different variable groups, or to compare the results of two different studies.